JFK Tapes » Would They Use Tactical Nuclear Weapons in Cuba? 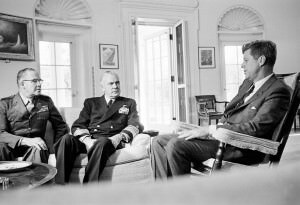 Marine Corps Commandant General David Shoup (left) and Chief of Naval Operations Admiral George Anderson (center) meeting with JFK in the Oval Office on October 29, 1962. During their meeting with JFK in the Oval Office on October 29, Marine Corps Commandant General David Shoup and Chief of Naval Operations Admiral George Anderson gave a rundown on what an invasion of Cuba would look like and reviewed interservice cooperation. Shoup also raised the possibility of whether the Soviets might use tactical nuclear weapons in Cuba. After low-level surveillance flights photographed nuclear-capable short-range rockets in Cuba (known as FROGs in the West and as Luna to the Soviets), military commanders in charge of invasion planning requested authorization to plan for the use of tactical nuclear weapons. Secretary of Defense Robert McNamara denied that request. Shoup . . . at that point, because they would deal bloody hell with Guantánamo, of course. If nuclear weapons start down there, I’d say we’re at nuclear war. We couldn’t afford to let them do that. I mean they’re not [unclear]. JFK But my guess is, well, everybody sort of figures that, in extremis, that everybody would use nuclear weapons. The decision to use any kind of a nuclear weapon, even the tactical ones, presents such a risk of it getting out of control so quickly, that there’s a . . .
Shoup But Cuba’s so small compared to the world. JFK I’m sure they do. I’m sure they do. Shoup The Russians say [to the Americans]: “We got the keys and you got the keys. You trust us; we trust you” . . .
JFK No, we don’t trust each other. But we figure that they’re never giving them to the Cubans, anymore than we’d give them to, you know, the Turks. JFK Because we know that . . . I don’t think anybody wants that weapon to escape from their control. It’s just too . . . Tape 43, Presidential Recordings Collection, President’s Office Files, John F. Kennedy Library. Excerpted from a transcript to published in David Coleman, ed., The Presidential Recordings: John F. Kennedy, volume 4 (New York: W.W. Norton, 2013). An earlier version of this transcript appeared in Ernest R. May and Philip D. Zelikow, eds., The Kennedy Tapes: Inside the White House During the Cuban Missile Crisis (Cambridge: Harvard University Press, 1997).